Wow, this took me long enough. Anyway, on to the amazingness that is Season Eight. 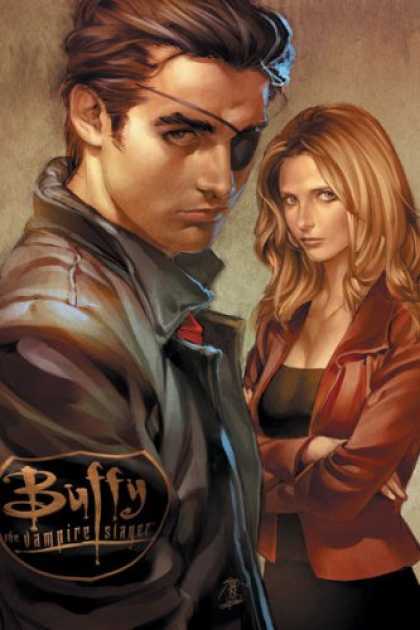 The Cover- In my opinion, Jo Chen does no wrong on Buffy. Her Buffy is very Buffy, which I approve (does that even make any sense? No? Good). I feel that her Xander is too pretty boy Xander, not the General Fury Xander vibe Xander has going on. Also, I think of John Travolta when I look at Xander, which is not what I’m supposed to see when I look at Xander. But I still love the cover. Interior Art- Once again, I really have no complaints. Amy still doesn’t really look like Amy to me and the General still looks too old to me, more like nursing home material than Rulk to Buffy’s Hulk. I feel that Giles doesn’t look like himself either, but he does, so I don’t know why I feel he doesn’t look right. Maybe it was the colors or the shading. I really want Willow’s dress at the end, it looks so pretty! I would so buy a replica of that for my eventual trip to Comic Con or C2E2 (it’s closer). Plus Xander in yellow duck pjs make any comic a win. Writing- I liked this issue, but I have some complaints with it. For example, Buffy has this really weird dream that I feel was very messy and seemed like it had been thought of the last-minute. However, in other instances the writing was spot on. Like Andrew’s speech that will be featured at the end as well as Xander’s “This is the crappiest sacrificial dagger I’ve ever seen.” I also feel like the Buffy true love kiss was too cliché and set up something completely unnecessary in later issues that kinda bothered me. Eh. Joss makes up for it next issue. Andrew:…Lando Calrissian’s outfit. And I know a lot of you were gonna say ewoks, but that’s too easy. I love Empire, of course. I love Empire, let’s not waste time questioning my loyalties, but the moment I saw Bill D. in the Hizzy I smelled the troubles. I mean it’s great that George Lucas wanted to have an African-Bespinian character in the mix, but then he shows up with the cape and the little bell bottoms and I’m thinking, “Oh, he’s gonna help Han and Chewie just as soon as he finishes the magic show for the kids’ birthday party,” I mean, knock, knock, common sense trying to get in, door’s locked, I’ll buy a race of teddy bears with unstoppable tree-trunk technology any day over that outfit on a leader. That outfit gets you beat up, is what. Especially at a.. Pep Rally in junior high where you were supposed to be dressed like a cougar. From a friend I heard that. So. Does that answer your question? Andrew: ‘Kay. What, uh, was it again? I Hate You, Tony Stark! Enter your email here to be to be notified of new posts by a giant flaming dragon with a ninja on top. Where's the Dragon and Ninja?